Properly seasoning your meal can be difficult. Did you put in enough salt and pepper? Did you put in too much? Is there a better way to salt? 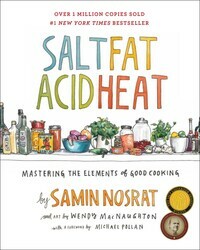 Samin Nosrat, author of SALT, FAT, ACID, HEAT shares her tips and tricks to salting evenly and more effectively. Test out these tips and tricks today! Once you realize how much salt it takes to season something properly, you might start to believe there’s no such thing as too much. This happened to me. I remember when a chef I particularly admired walked into the downstairs butchery room where I’d been sent to season pork roasts for the following night’s dinner. Having recently come to appreciate the power of salt, I decided that in order to cover the roasts evenly, I’d roll them in a huge bowl of salt to ensure that every surface was adequately coated. As she came down the stairs, her eyebrows shot up. I’d been using enough salt to cure the roasts for three years! They’d be completely inedible the next night. I spent the next twenty minutes rinsing the salt off the meat. Later, the chef showed me the proper hand grasp for distributing salt evenly on large surfaces. I didn’t understand the nuances of the act of salting until I began paying attention to the various ways cooks used salt in different situations. There was the way we salted pots of water for blanching vegetables or pasta with near abandon, adding palmful after palmful, only to await its dissolution, lightly skimming a finger across the rolling boil, tasting thoughtfully, and more often than not, adding even more. There was the way we seasoned trays of vegetables, lined up duck legs butchered for confit, even larger cuts of meat, and pans of focaccia ready for the oven. This was done by lightly grasping the salt in your upturned palm, letting it shower down with a wag of the wrist. This grasp—not the hovering pinch I was used to—was the way to distribute salt, flour, or anything else granular, evenly and efficiently over a large surface. 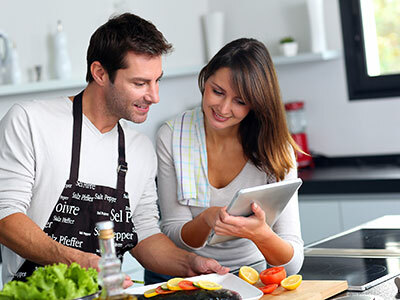 Practice the wrist wag in your own kitchen over a piece of parchment paper or on a cookie sheet. Get used to the way the salt falls from your hands; experience the illicit thrill of using so much of something that we’ve all been taught to fear. First, dry your hands so the salt won’t stick to your skin. Grab a palmful of salt and relax. Jerky or robotic hand motions make for uneven salting. See how the salt lands. If it lands unevenly, then it means you’re seasoning your food unevenly. Pour the salt back into the bowl, and try again. The more your wrist flows, the more evenly the salt will land. This isn’t to say that you never want to use a pinch of salt, which can be used like a nail-polish-size bottle of touch-up car paint to fix a scratch on a fender. It might not have much potential to repair major damage, but applied precisely and judiciously, it will yield flawless results. Use a pinch when you want to make sure each bite is salted just so: slices of avocado atop a piece of grilled bread, halved hard-cooked eggs, or tiny, perfect caramels. But try to attack a chicken or a tray of butternut squash slices with the pinch, and your wrist will give out long before you’re done. Now that you can salt properly, learn the perfect liquid-to-grain ratio.